I love watching and reading travel features on different countries and one place that I got so intrigued and amused with was Bali. Travelers would get enchanted with the beauty, culture and spirituality of the place thus the coined phrase "The Spirit of Bali". On our first stop, we made our way to Kuta, the place is known for surfing, shopping and the night life. The place is also popular among backpackers because of the affordable inns and hotels found around the area..
On our first morning, as we made our way to Kuta beach, we saw and experienced how religious the Balinese were. Everyday the Balinese would make offerings to their gods which is called Banten. The Baten is usually put inside a woven leaf with an assortment of items. The items can consists of rice, fruits, flowers and even cigarettes. During our whole trip, we saw different small offerings everywhere, from the temples, the stores, the streets, on top of a car, inside a cab, the list just goes on and on. We asked one of the cab drivers about the daily ritual and he said that they do this to appease the gods so that they'll have good karma and get blessings from the heavens. Even though Kuta is filled with modern amenities and commercial establishments, there were still a lot of temples around. This is one of the temples that we saw while making our way to the beach. Right before the beach area, there were stall of shops selling different an assortment of items. Jim and Jon happily bought Bintang sleeveless shirts. Travel Tip: If you plan to buy something, always haggle! We would ask for one-fourth of the amount and most of the time, the vendors would agree. There was also a temple right in front of the beach, the locals told us that the temple was there to protect the surfers and swimmers. This is because, Balinese are actually wary of getting in the water, they are afraid of being taken away by a sea god. As soon as we stepped on the fine white sand, vendors started to crowd over us. They were offering an assortment of products and services. We wanted to surf and try out the waves in Kuta, we got two boards and asked two surf instructors to go with us to the sea. 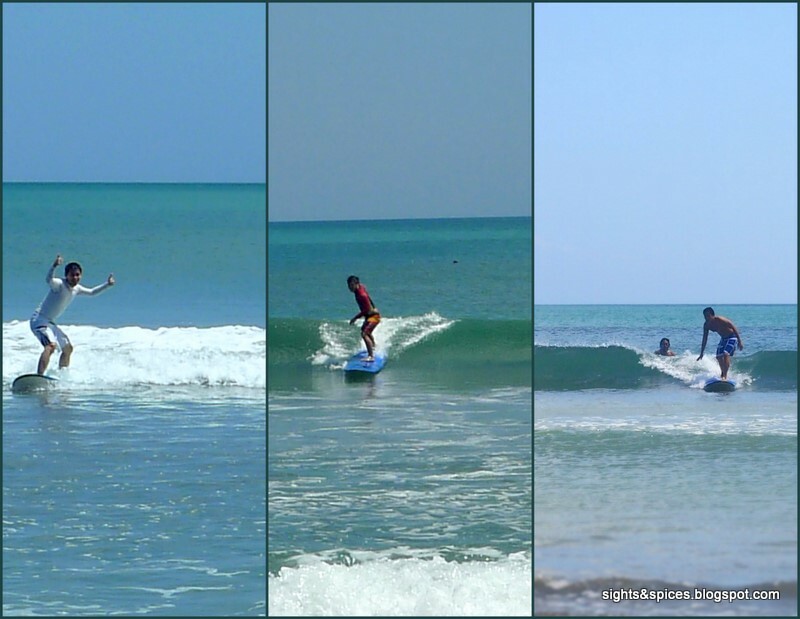 The waves of Kuta was really nice, it doesn't break early giving us a smooth long ride one after another. We had a blast surfing the waves of Kuta. Jon, Jim, Jay enjoying the Long Ride. Since this is a surfing beach, there are times that the waves gets really high that its too dangerous for a swim. The shore stretch long and wide. It was really nice taking a stroll along the shore. Since tourism is the main source of income for the Balinese, it can be tiring to smile and to say no to all the vendors who would offer things and services. But still we enjoyed our stroll around shore. We even reached the Legian Beach area and dined in Ku De Ta. Legian Beach had more up scale resorts and hotels and the area is relatively quieter compared to Kuta. After a very late lunch, we made our way back to Kuta beach and enjoyed the beautiful sunset. The streets of Kuta are lined up with massage parlors/spas. Be sure to have a relaxing traditional Balinese massage. I usually have swedish massages every so often but the Balinese style was more soothing . The Balinese massage uses all five fingers and the whole palm to rub parts of your aching body while the Swedish style is usually limited to the thumb. The traditional Balinese Massage is a must try in Bali! The streets of Kuta was filled with tourists, mostly Aussies and Europeans. For people who likes to surf, shop and go bar hopping at night, Kuta would be the perfect haven. There are stores and bars that lines up the streets of Kuta which are open til the wee hours of the morning. Kuta felt kind of hectic and chaotic but this didn't stop us from looking for some tranquility and quiet time. We wanted to further experience the Balinese culture so as our next stop, we went to Ubud. But before heading to Ubud, we made our way to Uluwatu Temple. The temple is one of the most beautiful temples in Bali since it is built and situated right on an edge of a cliff. One has to hire a car or van to reach this area or you can look for tour groups to save on transportation expenses. Before entering temples, visitors had to wear sarongs as a sign of respect to the gods. The sarongs are free to rent at the entrance of the temple. There were free roaming monkeys that surrounds the temples. Make sure to keep guard of your stuff because they can get naughty and grab you stuffs. The breeze was cold and fresh but more importantly the view was breathtaking and spectacular. This place is definitely a must visit! Luckily for us there was a scheduled show of the Kecak and Fire Dance that evening. We made our way to the amphitheater to catch the show. The Kecak show is named as such because of the chanting sound that the men produces during their performance. The show starts with the men chanting rhythmically as they form a circle around an altar. Then the story of Ramayana unfolds,the characters performed traditional Balinese dances depicting the epic story. The show ended with the Fire Dance. The monkey king, Hanoman dances around and stomps the fire away. After the show, we had the chance to take pictures with some of the lead characters in the performance. It was already dark when we reached Ubud. We immediately noticed that compared to Kuta, Ubud's was way quieter and calmer. The temperature was way cooler and the breeze smelled and felt fresher. The trip to Ubud from Uluwatu was roughly around 3 hours, the town is known for it's nature surroundings and is the perfect spot to learn more about the Balinese culture. One thing we noticed in Bali was the intricately designed entrances to homes and temples. One of the design of the entrances is the split type gates known as Candi Bentar. On each end of the gate there are usually two stone sculptures of mythical creatures who stands guards. On our first day in Ubud, we decided to take a stroll to wherever our feet will take us. One noticable thing about Ubud is the art scene, the streets are filled with different stores that were selling paintings. We stopped to have a look at Ubud Palace, it served as the residence of the Ubud's king before. Having a look inside gives you a general idea how the Balinese houses were lay out. There were a lot of intricate sculptures inside. After having lunch, we continued our stroll, we stopped by Cafe Lotus to take a peek at what's inside. We were so amazed with what we saw, it was so beautiful! Lotus plants and flowers floating on the man made pond, a pathway with stone sculptures on the side which leads to a stage and an elaborately designed gate at the end. As we continued towards the road, we saw and went inside the Blanco Renaissance Museum. Don Antonio Blanco is a well loved artist and painter who married a Balinese dancer and has resided in Bali til his last living days. The whole compound where the museum was built also served as their home and workshop. Aside from Don Antonio's paintings, the works of his son Mario can also be seen in another gallery. Welcome drinks were served and different species of colorful birds welcomed us. The main museum hall looked like it had French and Balinese style influences. It looked so classy and elaborate. Taking pictures inside the museum hall wasn't allowed. I got to take some stolen shots to show how elegant the place looks. Most of Don Antonio Blanco's paintings focuses on the Balinese women, according to him the Balinese women have the most beautiful bodies because Balinese women have broad shoulders and are full breasted. We went out the rooftop and enjoyed the view of the vast greeneries that surround the compound. There were also angelic looking golden Balinese dancer sculptures. I asked one of the local Balinese painter on how they revere Antonio Blanco. He pointed out that Antonio Blanco's style of painting was more on the renaissance smooth free flowing style. His style was totally different from the traditional very meticulous Balinese style of painting. So art wise, the local artists doesn't really get to connect with Blanco's painting. But he pointed out that Antonio Blanco has given back a lot to the community and he is well loved and respected. The next day we made our way to the Sacred Monkey Forest. The forest serves as a sanctuary for monkeys and there are also different temples inside. The place was quite big, it is surrounded by more than a hundred species of trees and plants.There are different pathways to take and each pathway brings surprises. With more than 500 monkeys and their population growing every year, they are kings in this place. People can actually buy bananas to feed them or just watch them run, play and lounge around. The monkeys are so used with people that they can actually climb on top of you. So be sure you don't have any valuables on hand, the monkeys can grab and take them away. 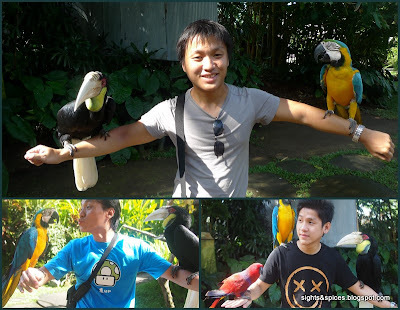 That same afternoon, we hired a van and driver to take us to more places of interest in Ubud. Our first stop was at Tirtha Empul Temple. The temple is also known as Holy Water Temple. Worshipers would make offerings, take a dip in a small stone carved pool and let spring water that was spouting out from the fountains to wash and cleanse their whole body. I decided to take a dip and do what the locals were doing. The water was cold, clean and refreshing. More importantly, I got to interact with the locals while waiting for our turn. Even though they don't speak much English, I had fun chatting with them. The Balinese believe that the bathing tradition have purification and curative properties, I even saw some worshipers bottling the water. I asked them what they'll use the water for, they told me that they'll bring home the water for drinking and also use it for prayers. Our guide asked us if we took a dip, I said I did. He happily told me that bathing in the pool was good for the soul. Our next stop was at a Kopi Luak Coffee Plantation. The three of us loves good coffee, this is one spot that we were excited to visit. We were lead inside of what seem to be a huge garden. Aside from the coffee plants, there were an assortment of fruits, spices and herbs planted around the whole area. I pretty much have an idea where coffee comes from. 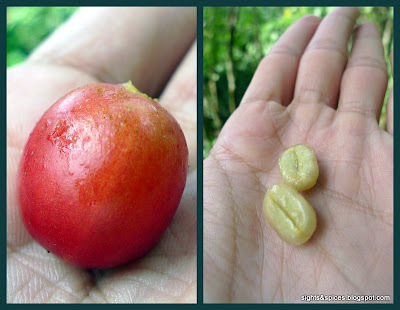 But this was the first time for us to see an actual coffee plant and coffee berries. There were two kinds of coffee plants, the Arabica and the Robusta. 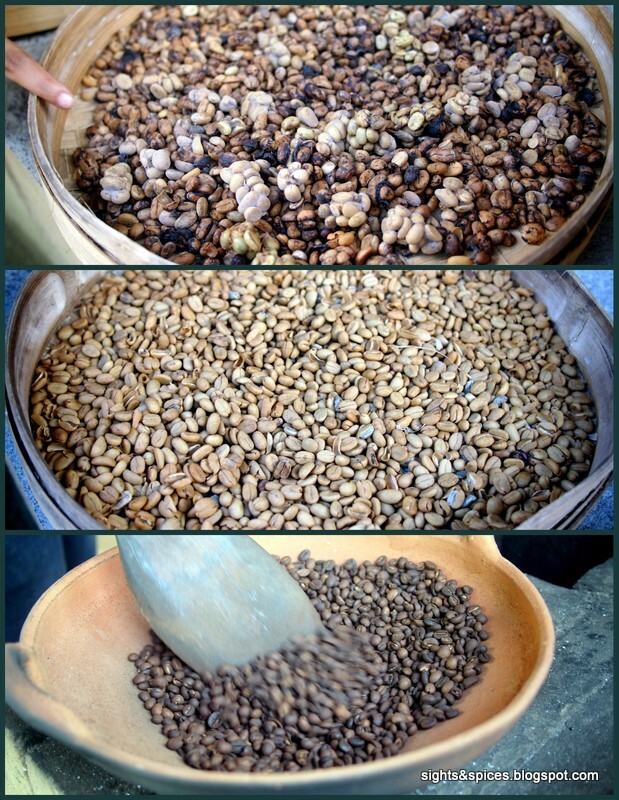 The guide explained to us the process of making Kopi Luak. At night, the Civet Cats are released from their cages and they start to feast on Arabica Berries. (They only eat the best variety which is Arabica). The seeds or beans from the berries aren't digested so when it comes out from the cat, it comes out whole. The beans are washed thoroughly then it's roasted manually. We were surprised when our guide told us that we can eat the berries. We tried it and absolutely loved the sweet tasting berry. We were then lead to a nippa hut where we were to taste and drink the most expensive coffee in the world. The cup of Kopi Luak costs 50,000 rupiah, with it came small tasting portions of different types of coffee and tea. We very much enjoyed the time we spent in the Coffee Plantation, I've tasted Kopi Luak before and so far this was the best I've tasted. More of this on my next post, The Flavors of BALI. The car briefly stopped at a roadside so we can take a look at Mount Batur in Kintamani.Tourists can actually go on a hiking trip up to the peak but due to time constraints we admired and took pictures of the majestic looking active volacano from afar. As our last stop, we went to look at the Rice Terraces. The rice terraces looked puny compared to what I've seen back home. There wasn't much to see but nonetheless, we enjoyed the cool breeze. We ended our trip with a long wonderful dinner at one of Asia's best restaurants, Mozaic. Keeping in touch with nature, we had dinner under the moonlight in the plush garden inside the restaurant. Bali was truly an enchanting place, we got to see and experience the beauty, culture and spirituality of the place. I understood why tourists loves Bali, the beauty and the rich culture was just amazing. What we like about Bali is the state that it instilled in us, as soon as we landed we felt all our worries and stress seep away. Bali epitomizes the phrase "Hakuna Matata", it is absolutely a worry free, problem free haven.